Cows are sacred, salt is expensive, cross the sea trading is prohibited and immigrants had to get to New York. In a nut shell, those are the four substantial situations that had to occur in order to bring brisket to your dining tables today. Happy St. Patrick’s Day dear readers! 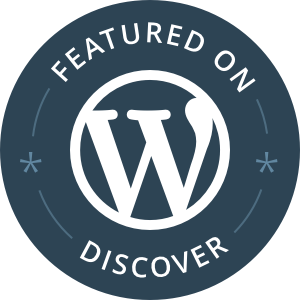 Today’s post is all about a traditional Irish food that actually is, in reality, a multi-cultural collaboration between three countries. 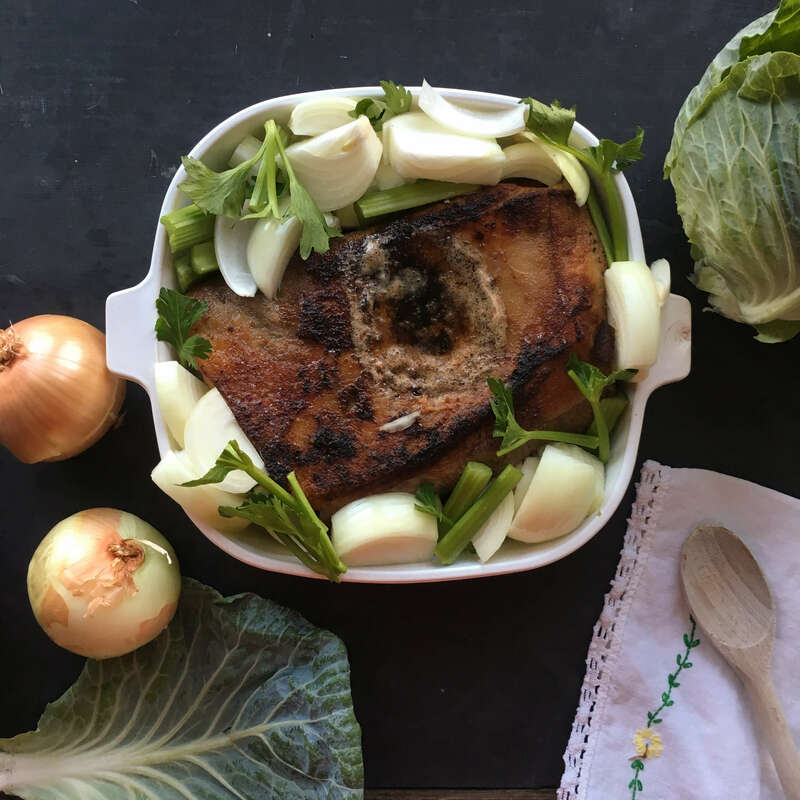 While it is certain that many a crock-pot will be simmering away today in honor of the holiday, and the famous corned beef and cabbage that has become associated with it, you might be surprised to learn that the propulsion for this traditional heritage food actually has more to do with New York City than Ireland. The Kerry cow is considered to be the oldest breed of cattle in Ireland. It all started back in Ireland’s ancient times when cows were considered sacred animals. Valued for their milk and their strength over anything else, Irish cows were essential components to a working farm and were never considered a viable meat source. But England adored beef, particularly roasts, so much so that by the 1600’s, England couldn’t keep up with their own country’s supply and demand. So they went to Ireland to see about some cows. A good revenue stream for the Emerald Isle, and a can’t-live-without-it commodity for England, this cow commerce between countries was mutually beneficial for all. That is until the Cattle Acts of the 1660’s. In an instant, thanks to the Act, the sale of live cows to England was no longer allowed. The sudden halt in commerce left Ireland scrambling for a solution and left England grumbly with hungry bellies. This all came about at a time when salt was also an extremely expensive ingredient in England. Ireland, on the other hand, was not only flush with cattle but also abundant with coastal salt pans. The combination of these two riches formed a clever way for Ireland to package meat for export that skirted around the law. They created a new method of food preservation called corned beef – a salted meat product that could withstand time and travel to England without spoiling. 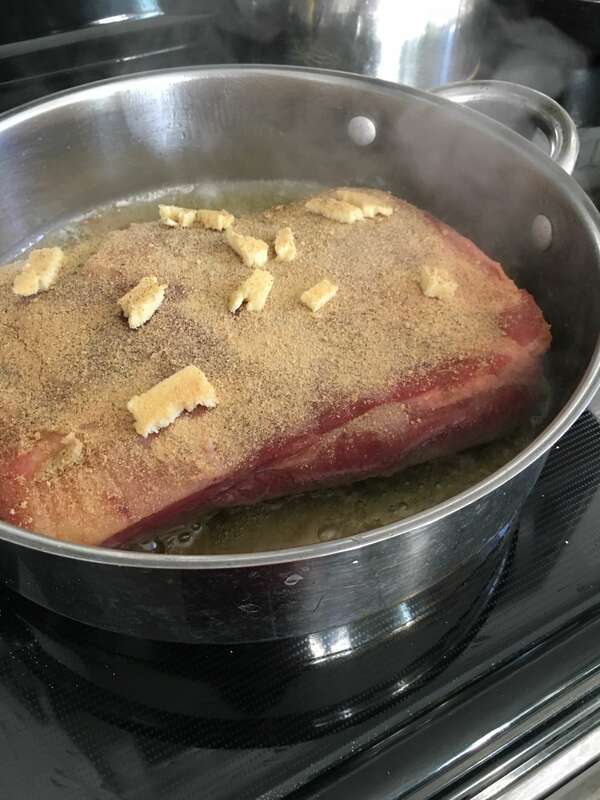 Coming from the brisket cut of the cow (located between the front knees and the shoulder area) this salt infused food was named corned beef because of the corn kernal-sized salt crystals used in preserving it. 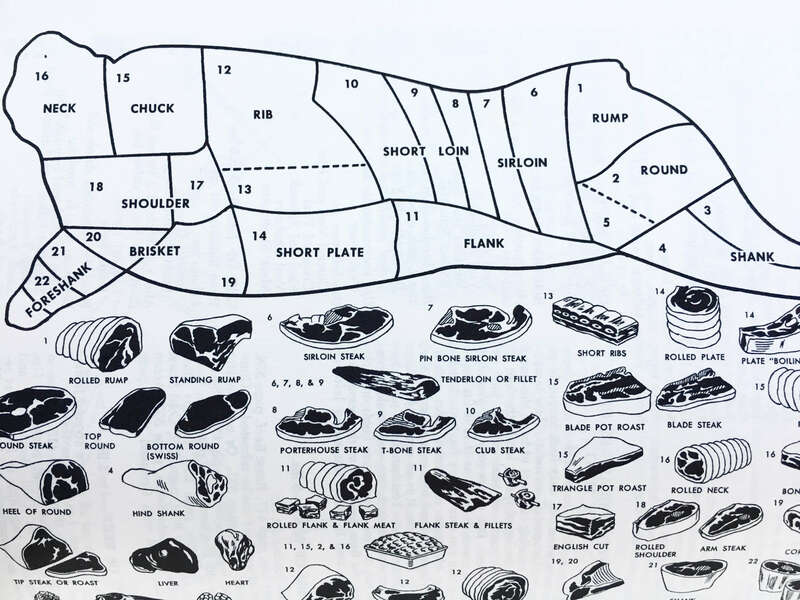 Generally known as a tougher piece of meat since that area of a cow’s body gets quite a lot of exercise, early corned beef was essentially just a slab of meat that was rumored to taste more like salt than beef. 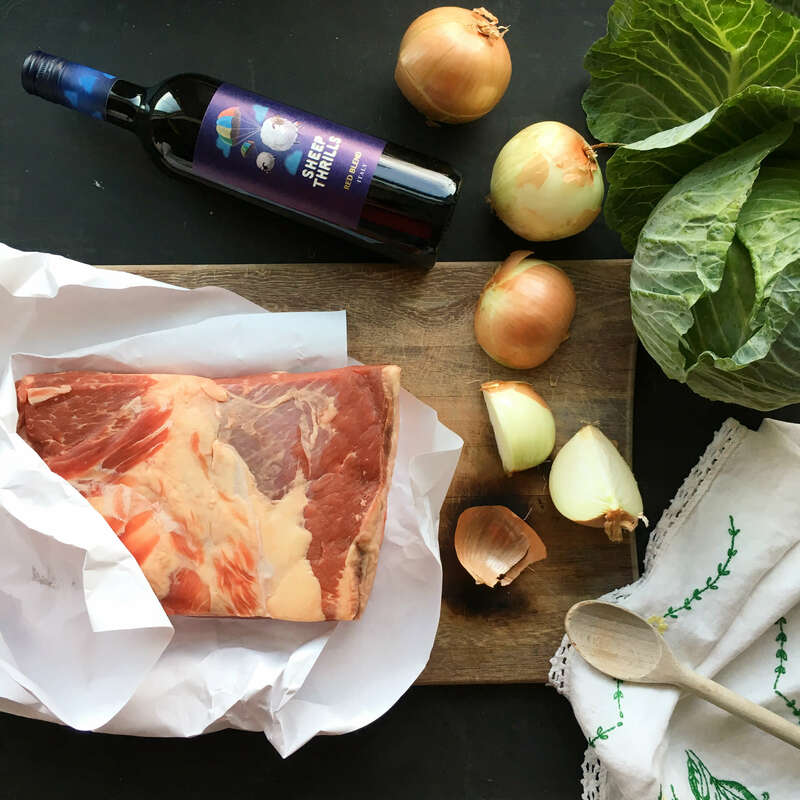 Because it was shelf stable, easy to prepare and came in bigger portions, corned beef became a popular staple in the diets of 18th century Englanders as well as sailors away at sea for long stretches of time. It even made its way into the diets of Early American colonists who were struggling to produce food for their new country. The only people who were not enjoying this salty slice of protein were the Irish, who, in a terrible twist of irony, couldn’t afford to buy the very product they were exporting. 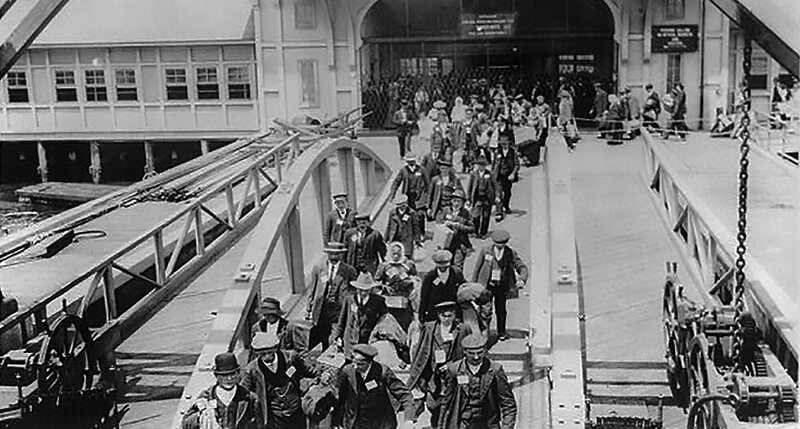 Newly arrived immigrants at Ellis Island. Photo courtesy of the Library of Congress. It would take one more century and a move to America before Irish immigrants were able to afford and enjoy the corned beef that made their home country famous. In the mid-late 1800’s, a majority of the butcher shops within the New York metropolitan area were owned and operated by Jewish immigrants. Living in close knit communities, both Irish and Jewish transplants bonded over feelings of displacement and discrimination experienced in their new world. Financial resources were a challenge for most city dwellers, but especially for these two ethnic groups in-particular, as they faced prejudices in work and social environments. 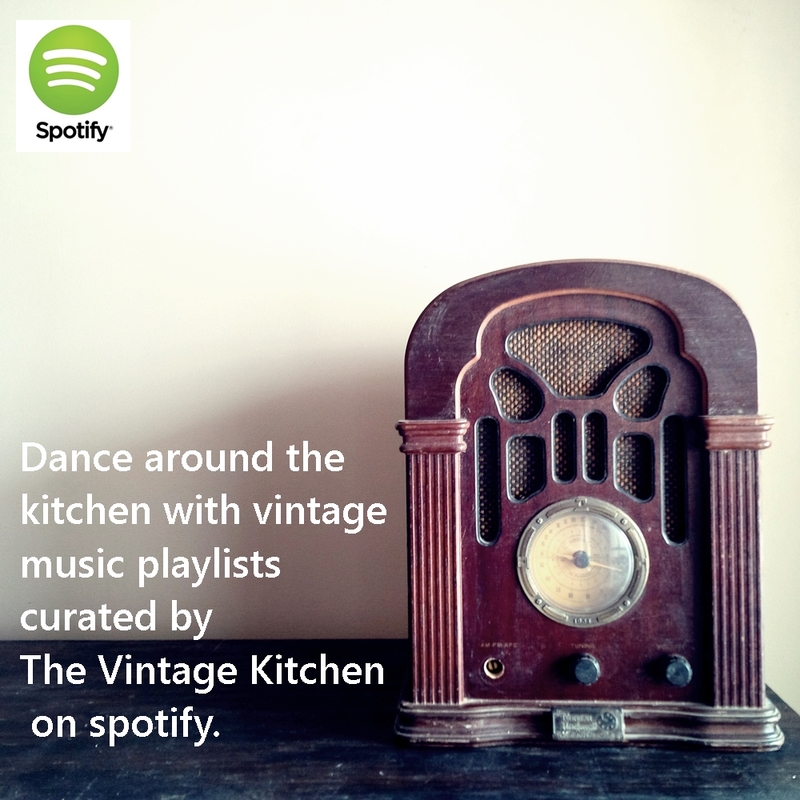 Luckily, food brought them together via thrift and necessity and novelty. Upon arriving in America, Irish immigrants were delighted to discover that corned beef was much less expensive in New York then it was back home in Ireland. Likewise, Jewish immigrants liked brisket because it was one of the least expensive cuts in the butcher shop and could feed a crowd. 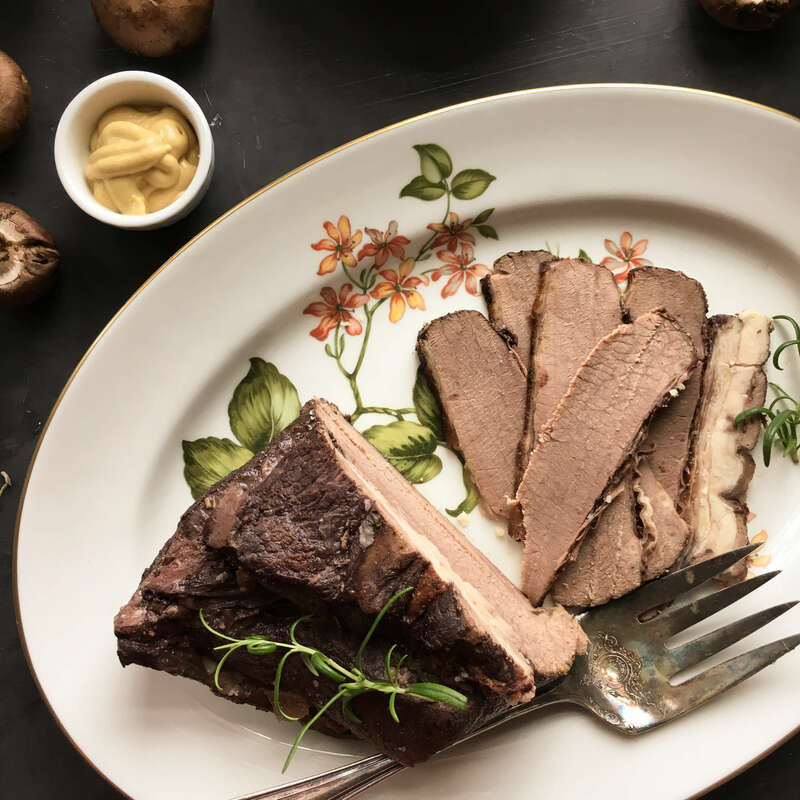 Through experimentation in their New York City kitchens, Jewish and Irish newcomers developed the low, slow cooking methods that eventually evolved brisket from a salty slab of preserved meat into a rich and flavorful meal. Cabbage was often paired with it since it was the least expensive vegetable. Both cultures developed their own trademark dishes – slow simmered corned beef and cabbage for the Irish and smoked pastrami and sauerkraut for the Jewish community. Each specialty stemmed from the humble brisket cut. 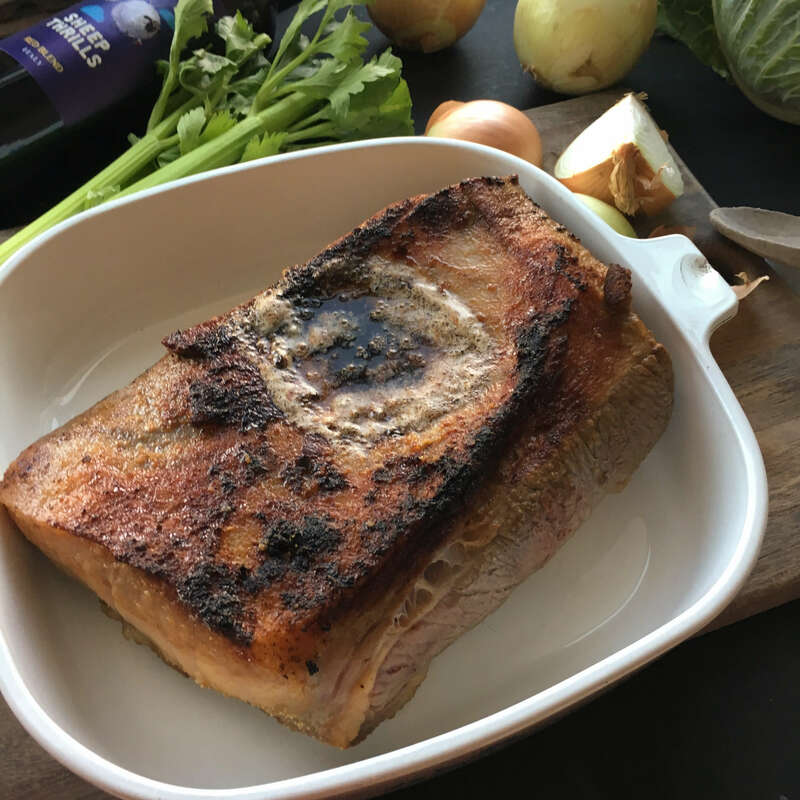 Today’s recipe focuses on the Jewish side of cooking, with a brisket that quickly browns in butter on the stove top before heading into the oven for a slow simmer in red wine. 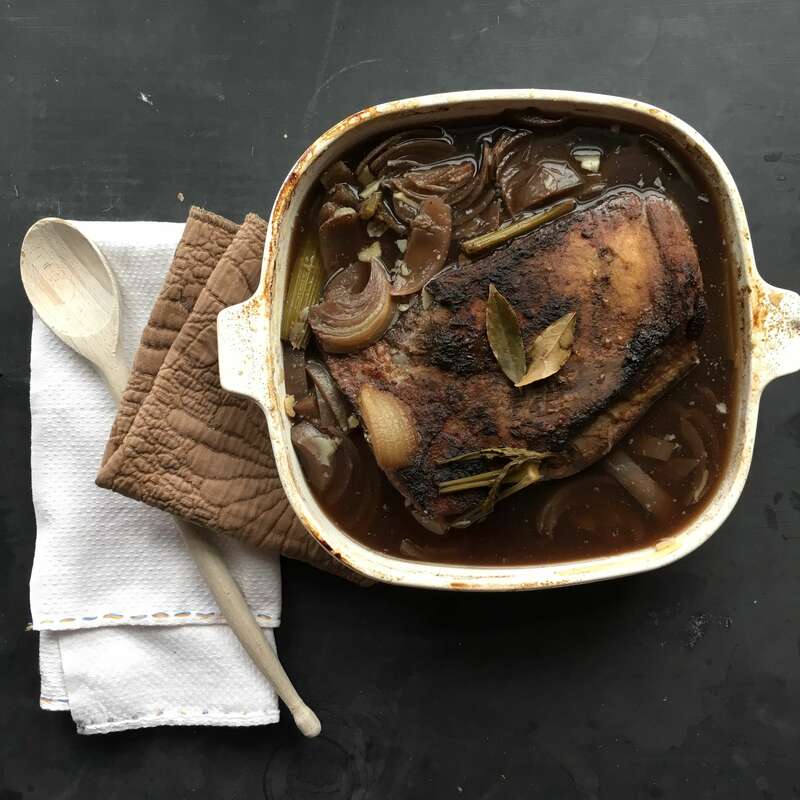 If you are not a fan of the saltiness of traditional corned beef, or are wary of the seasoning packet that comes in most store-bought brisket kits, this recipe is a great alternative, since you can control your own level of spices. 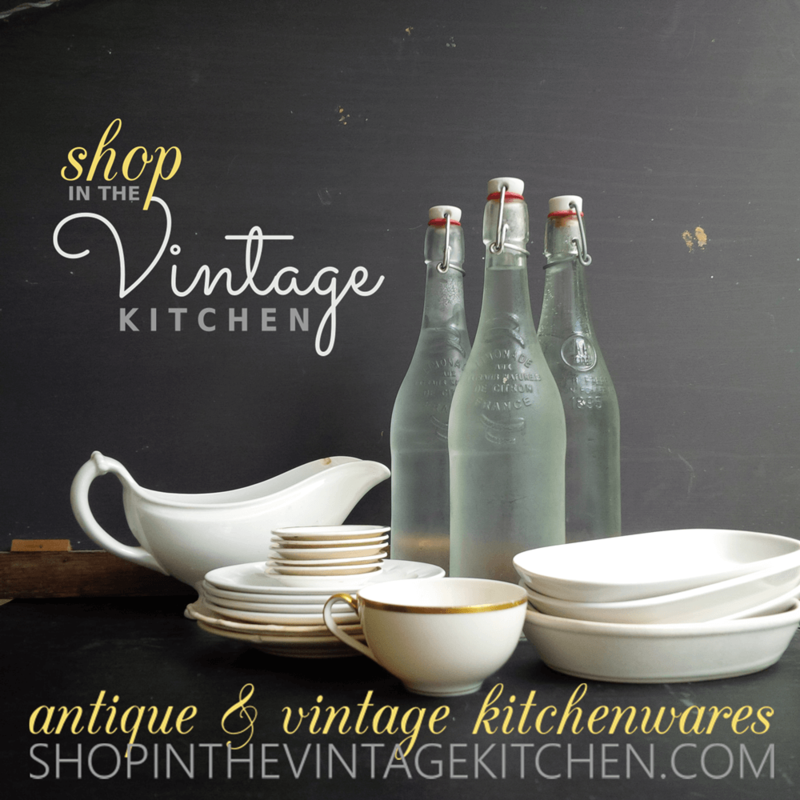 It comes from Annie, an avid cook, and a world traveler who lived in New York for most of her life. A dear friend to my father, she’s proud of her Jewish heritage and is famous for many signature dishes including homemade horseradish (more on that in a future post). 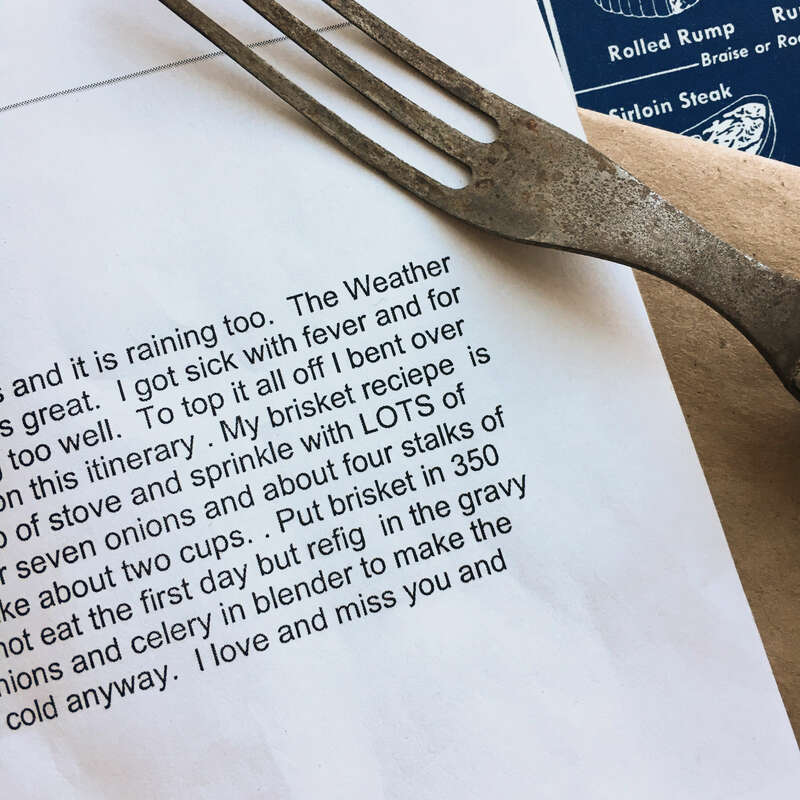 Annie sent this recipe to my dad over email 15 years ago while she was at sea traveling between Buenos Aires and Santiago. The trip was rough with wild waves and cold temperatures but Annie was more than happy to take a few moments to share her way of making brisket. In our modern age, email letters aren’t quite as pretty as handwritten ones – but the sentiment is there nonetheless. My dad has hung onto her correspondence for over a decade and a half. I discovered it recently, tucked inside one of his favorite cookbooks. Although it requires two days to make, it is very simple and involves just a few ingredients. I used grass-fed beef from the farmers market and a red wine blend called Sheep Thrills for the fun pun. Also, Annie cooks like James Beard recommends – with your intuition – so she doesn’t specify in her recipe exactly how much seasoning to use. In the directions, I share my method, but you may want to add more or less depending on your preference. Remove the brisket from the packaging and let rest on the counter for 45 minutes to 1 hour. If you are using frozen grass-fed beef make sure that it has completely thawed in the fridge before beginning this recipe. Do not trim the fat from the brisket. Seasonings with dots of butter on top before the flip to brown the other side. In an ovenproof pan (preferably one that has a lid) over medium high heat, add the butter (but only if using grass-fed beef, otherwise omit the butter). Generously sprinkle each side of the meat with the onion and garlic powders and the celery salt (I did about five passes on each side with each of these seasonings). Brown the brisket, fat-side down, for 5 minutes on each side. Roughly chop the onions and the celery and add them to the brisket pan. Let the brisket cool to room temperature and then refrigerate overnight it in the same pan that you cooked it in so that all the juices can soak back up into the meat. The next day, remove the pan from the fridge and scoop off the top layer of fat. Remove the onions and celery to a blender and mix until well combined. 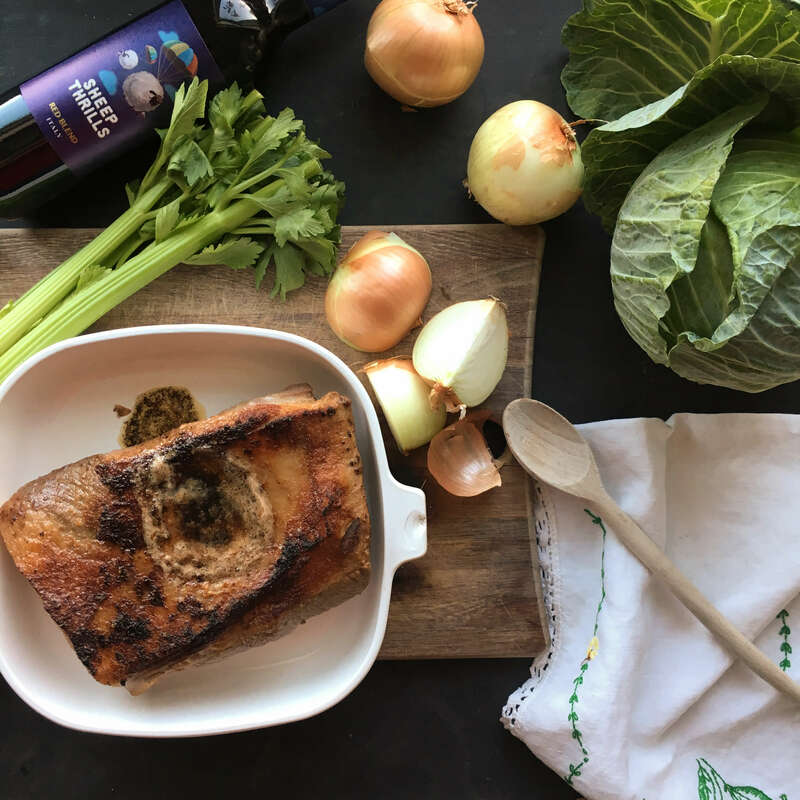 This will form a thin au jus style gravy which is delicious for dipping. Transfer the au jus to a small saucepan and warm over medium heat. 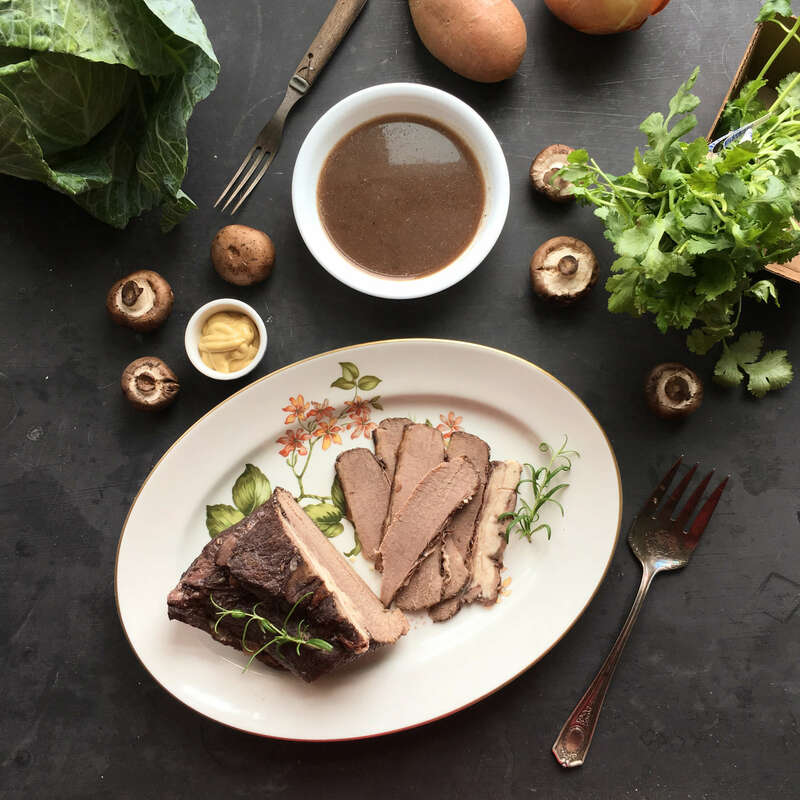 Next, thinly slice the brisket and serve cold or at room temperature alongside the au jus and/or with your favorite condiments like mustard, mayo or horseradish. 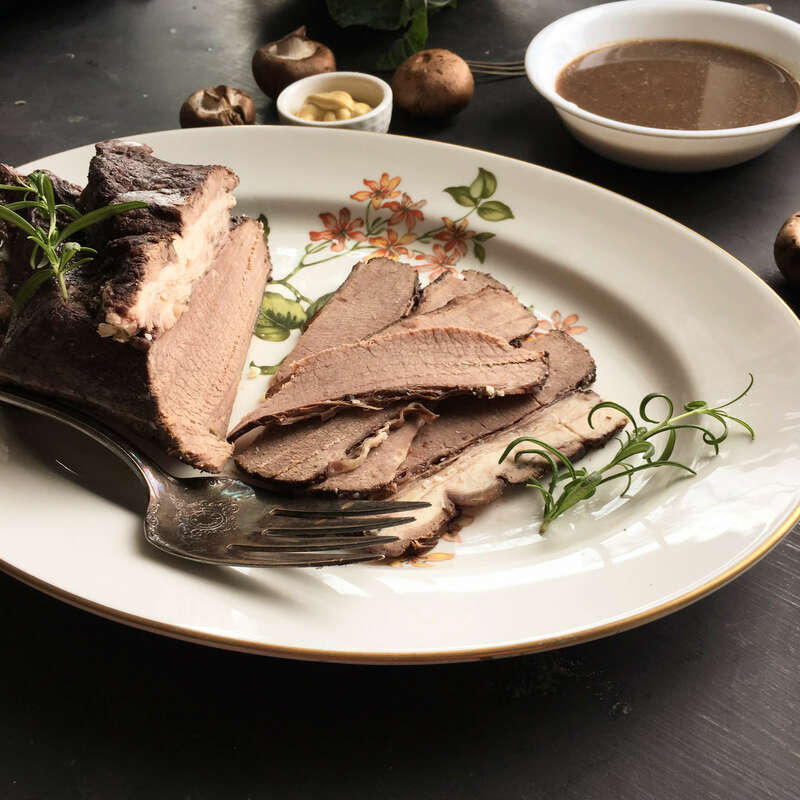 This style of brisket is perfect for French Dip style sandwiches served on crusty rolls. It also travels well for spring-time picnics and outdoor family gatherings. In Annie’s house it is a staple for many Jewish holiday celebrations. Simple fare with a collaborative past, that’s the brisket in all its wonderful ways. There is something lovely about Annie’s recipe that ties all the historical elements of the holiday into one tidy package. 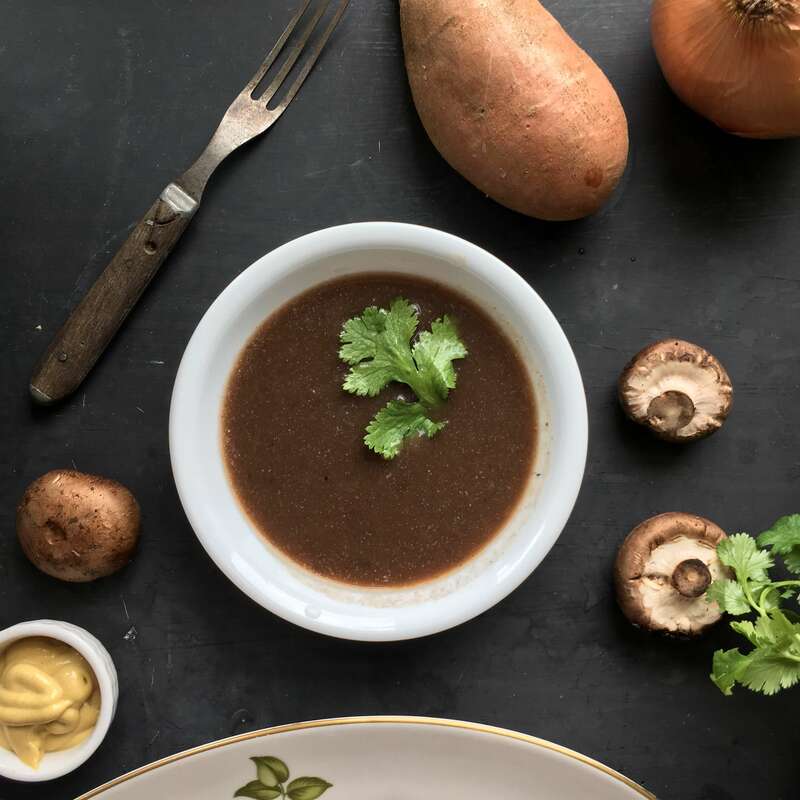 With its Irish and Jewish heritage, its international transmittance and Annie’s New York roots, it feels like this recipe really embraces the spirit of the holiday. The parallels are endless. The recipe was written on a boat in the 2000’s featuring a food that was once eaten by sailors in the 1700’s. Annie lived in New York during the 20th century. The immigrants who helped perfect this style of cooking lived in New York in the 19th century. Annie is Jewish. The butchers who sold brisket cuts to the Irish in NYC were Jewish. Annie uses brisket to feed her family on Jewish holidays. The Irish-American community uses brisket to celebrate their national Catholic holiday. St. Patrick’s Day isn’t only for the Irish – it’s for everyone in America who hand a hand in building a country where people and food worked together to create new things and new traditions in a new land. Cheers to foods that continue to bring people together in surprising ways. 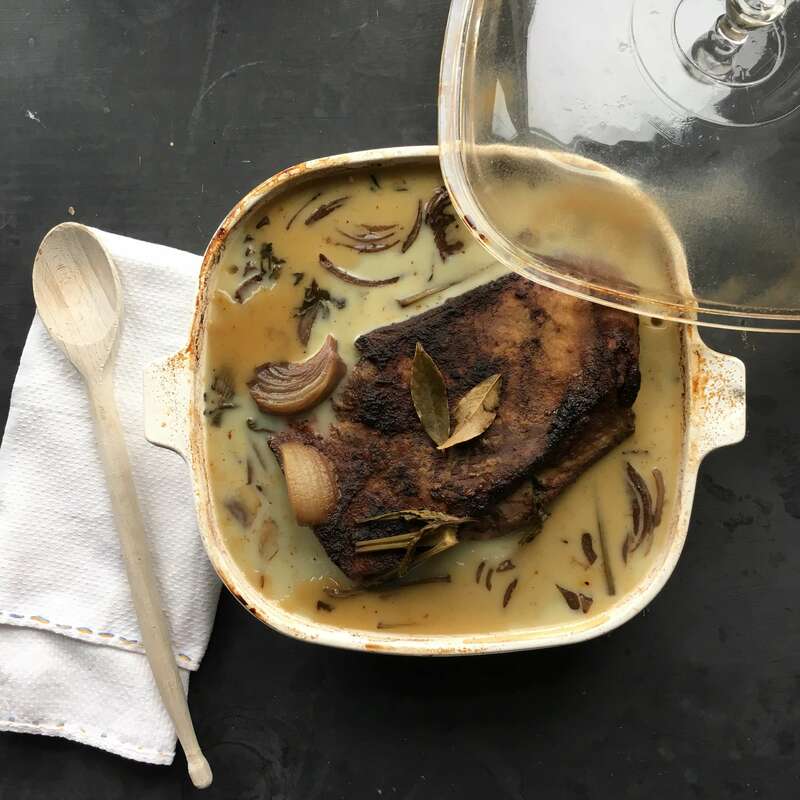 And cheers to Annie for sharing her delicious brisket recipe. Hope this St. Patrick’s Day is your most festive one yet!